Description: The original documentation for this aberrant was provided by Willis Pinkert, the current leader of the Danby Family Outfit. 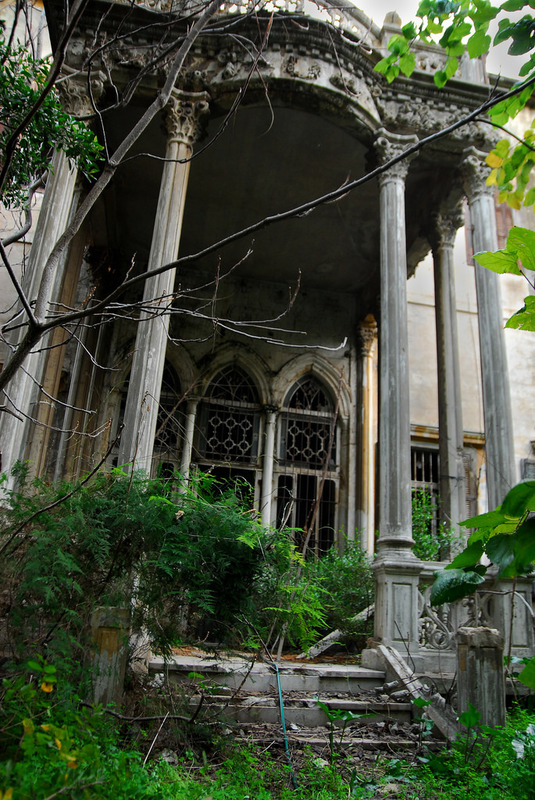 The Mitchell Manor was an abandoned, three-story mansion/estate that was in an extreme state of disrepair. The exterior always appeared decrepit, but the inside could change. Looking through the windows, the rooms and walls seemed well taken care of, like someone lived here. Except the floor was covered in animal bones. Judging based on how they were lyin' there, they died naturally. The wallpaper was this nasty yellow color, the same color as the fungus that grows on dead things, and had a strange pattern that seemed designed to confuse you. We found one room upstairs that had bars on its windows, and lookin' in, we saw an empty doorless room. The wallpaper here has what looks like a ring of constant wear about a foot off the ground. We know The Manor had a few happenings that you can see by just lookin' through the windows. Firstly, the wallpaper almost seems like it's moving, but it's such a strange pattern it may not be. The other trait was that The Manor seems to be able to fix itself. We'd made some minor scratches in the walls, and it just slowly fixed them. It looked like the walls themselves were trees that simply fix their wounds by growing around them. We theorize the manor had at least one haint, from the original owners, and at most two. When we've gone into the building on nights with a full moon, we've heard what sounded like voices. They whisper things so quietly, you'd think it's the wind or the house itself groaning, but they only whisper when there ain't a wisp of air floatin' through the trees. And if you spend more than an hour there, you get a pounding headache. Molly thinks it's 'cause of the wallpaper. Just looking at it makes your eyes swim. Almost seems like it were movin', but I reckon it was doing something to your mind. The journals and equipment we've found in the building seem to show that people who stay too long in there go crazy and disappear within it. Doctor Powell over in North Carolina called it "Psychosis", I think. Background: This building was originally built by Silas Mitchell around a hundred years ago. In 1894 to be exact, accordin' to some a' the town papers. He originally lived in Charleston, South Carolina and ran doctor's practice there. But he supposedly made the house for his wife to recover in, as she was sick. But after he and his wife went to the house, she was never seen again. He'd come to town every couple a weeks, and buy food, but according to rumors, he never bought more than he could eat himself. Silas disappeared about two years after moving to the manor. And the Danby family won it in the County Auction. Now, this was just before the Great Hunt of '32 began, and when it did, people largely forgot about the manor. When the Danby's officially turned their properties over to us, they didn't list The Manor, but listed its property, so we never investigated. It wasn't until '89 that we started to hear rumors about people disappearing in the woods. Now, we got a lot haints in these woods, so we didn't think much of it. Until a TV crew came in, blabbing about some haunted mansion. They went into the woods and lost all contact. When they never came back out, we decided to investigate. Location and Population: The Manor was about several miles past the lodge in Brummen Woods, which is already five miles from the edge of our town, Pine Mountain, in Georgia. We haven't had the chance to clear any trails to it from the lodge, so the last mile has to be hiked. To our knowledge there isn't anything else like this out there. But we called the Charleston outfit, just in case. Hunting Methods: Gasoline and a good spark. We cleared the brush around the manor itself, and worked a few days to clear most of the ivy off so it'd burn easier. Didn't risk going inside. Before it had to be burned, we put up a chicken wire fence, and a few "Do Not Trespass" signs. But it don't look like they did no good. Encounter Records: We didn't know exactly where this place was 'til we found it accidentally in 2001. Lucas, our primary tracker, found The Manor while he was out looking for a few Skinwalkers who supposedly were stalking the farms. The van and car from the TV crew were there. They was some ghost hunting show. Couldn't find none of them, but their equipment was still usable, so we went through their tapes. We added a few of them below. Note: George Frank is one of the hosts for the TV show. He had been in the manor for just over an hour. Producer: George, how are you feeling right now. George Frank: A bit cold, and kinda thirsty. Mind getting me a drink? Producer: Right. I'll send someone up with a few bottles. Now, you've been taking the footage like we asked? George Frank: Of course not! It's not like I've done any shows with you before. George Frank: Yeah, I done 'em. Producer: Alright then. Seen anything haunted? Notes on the walls? Voices? George Frank: The wallpaper is a trip. It's a yellow color mostly. At the back of the room is a big tear, it was bigger when I first got here, and it looks like it's closing. And the, uh, pattern… It's this weird wavy pattern. Kinda boring, but I wouldn't mind having this in my daughter's room back home. Producer: Is the pattern moving at all? Doing anything strange? We need something to keep us on air. George Frank: Uhh… I guess it kinda is. Thought it was just my eyes playing tricks on me. Note: Based on the other tapes, George has been in The Manor for 4 hours or so. Producer: It's been awhile, George. You still awake? Producer: Are you awake enough to tell me anything new? George Frank: Didn' take too much, sir. The wallpaper's making me a bit dizzy. Hard to concentrate. Head hurts. Producer: Is the wallpaper moving more? George Frank: Yeah. Spinning circles around me. Producer: Are you ok, George? We have the medic on standby. George Frank:Just getting a better view of the… Of the… Of the wall… paper. It's destroying at the base here. Producer: Did you mean deteriorating? Note: The producer tried to get in contact with George periodically throughout the night and next morning, but he never responded. By noon the next day, he tried to send a few of the aids into the building to find him, but no one was able to. The crew finally found him at 2pm in the doorless room on the second floor. He was unresponsive, so they set up a camera to record him. (02:11) George shuffles aimlessly around the room. Occasionally, he stops and scrapes at the wallpaper. (03:30) George slams his fist on a wall repeatedly. George Frank: I'm helping. Charlotte, can you hear me? (03:35) George sits in the northwest corner of the room and appears to be clawing at the wall. (03:52) George's hands begin to bleed from clawing at the wall. Through his efforts, a square meter of wallpaper has been removed. (04:19) George stops and crawls to center of the room. He appears to be listening to something intensely. George Frank: Yes? More wallpaper. (04:23) He begins to crawl around the room, clawing at the paper. (07:52) George stops clawing at the paper, but continues circling the room on his hands and knees. (08:04) TV Crew can be heard attempting to break into the room through the Southern wall. George continues to circle the room. The other major incident we had was after we put up the fence. We went back about a month later, and saw that the door was open. John and I quickly searched The Manor for anything that had changed, and found the partially decomposed body of a pretty young woman. Probably early twenties. She had a personal tape-recorder. We pulled the body out and contacted Doctor Powell to come look at it. Some of the wallpaper by her body was sloughing off, so we pulled if off and took it with us. Her ID indicates that she was Ashley Fredricks. A student at one of the universities in Charleston, South Carolina. Recording 1: (Ashley can be heard walking.) Alright, so this is the first, uh, log for Ashley's fifth exploration outing. I'm, uh… I'm going to the Mitchell estate. I got lost in the woods, so I'm getting here kinda late. (Ashley stops.) Ok, so from the front, this place is really creepy. Looks like no one's been here in forever. There's so many vines and weeds. Yuck. Ok, I'm going to go inside now. (A door can be heard opening, quickly followed by Ashley taking a quick gasp.) Oh my god! Does someone actually live here? (Several minutes of walking.) Ok, this is really weird. There's no food in the kitchen. Nothing really in any shelves or anything. Like, it's really clean and… I'll just take a few pictures. Recording 2: I explored the second floor of this place and I'm in the big bedroom now. There are some animal bones in here. I think they're from a deer. It's about 9pm right now, so the lighting is kinda bad. This whole mansion is actually kinda cozy so I might spend the night here and get more pictures tomorrow when the light's better. Recording 3: I woke up a few minutes ago, and I got a better view of this bedroom. So, the light in here is better now, but I think the wallpaper in this room is an optical illusion or something. Like, the light makes it seem like it's moving. Honestly, it's kinda cool. (Silence for several seconds.) I guess this place isn't as well kept as I thought. There's a really big mark around the whole wall. Looks like they were constantly moving furniture or something. When Doctor Powell arrived, he did a short autopsy and found that Ashley had died of dehydration and only a few days before we found her body. Her hands and knees were nearly scraped down to the bone. But the most interesting discovery was that her entire brain and both eyes had been removed from her body. There was no proof that they decomposed normally with the rest of her body. He took the wallpaper back to his personal lab, and we made sure to check up on the house more often. After about a week, he sent a message back that the wallpaper and most of the paste that stuck it to the wall was composed of Ashley's brain matter. Additional Notes: With that revelation, and the difficulty in getting to the Manor, me and Lucas made the decision to burn the house down. We don't have enough people to constantly keep others from going in the house, and we have bigger things we need to worry about. In June of 2003, Me and Lucas went to the house with enough Gasoline to fuel a truck for a year. We spent a few days making sure it would burn, and after the third day we set it on fire. I think we made the right decision. The Manor screamed at us when the fire caught. And didn't stop screaming until dawn, when the last embers went out.